Hi loves, how is the summer heat treating everyone? It has seriously been so hot the last couple of weeks here in the U.P of Michigan, but luckily this girl finally has a AC in her bedroom which means lots of time for blogging! 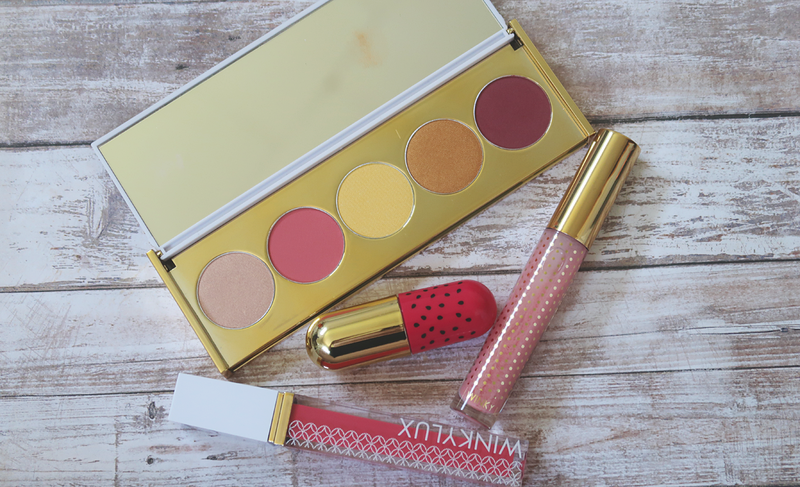 I have so many fun new products to share with you and I thought I would start off with some awesome new goodies from Winky Lux. A couple of these items are part of their new summer line. I was so excited when I received these goodies from Winky Lux. 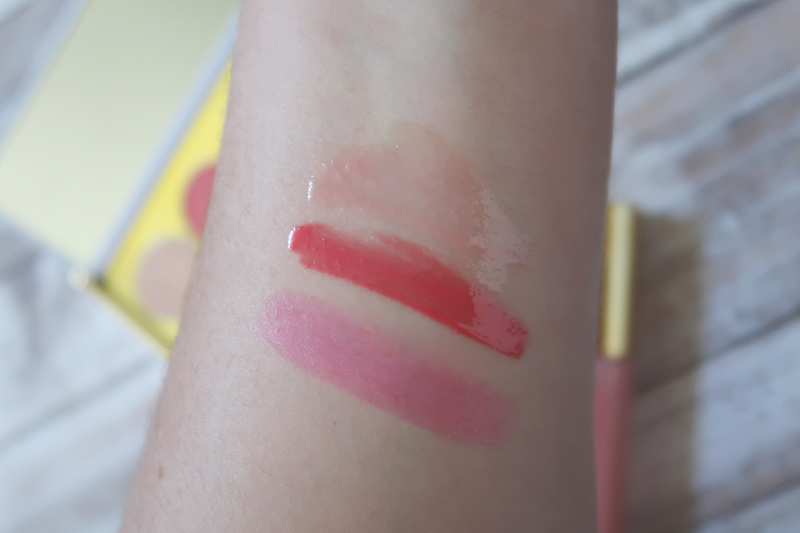 They sent over their new Marzia La Frutta Eyeshadow Palette, Pucker Up Lip Plumper in Pink Lemonade, Watermelon Jelly Balm and their Glossy Boss in Juicy. 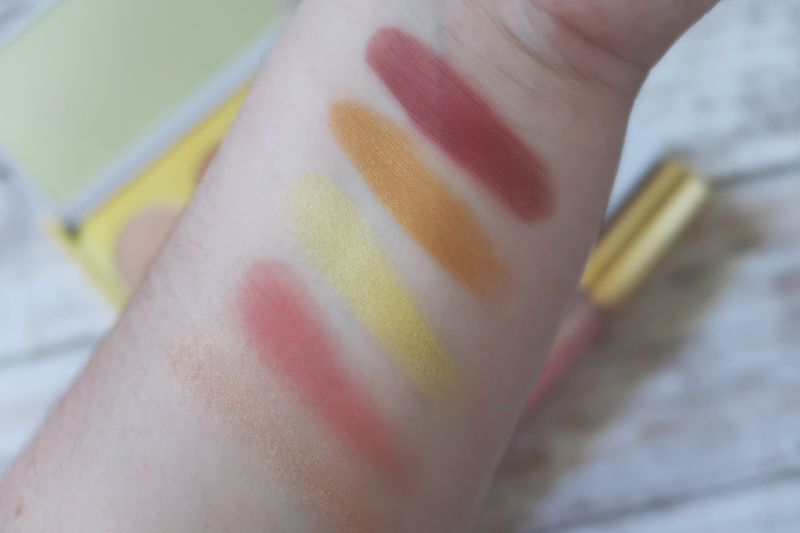 All shades are perfect for summer, but I was the most excited for the eyeshadow palettes because it just screams summer. Let's go over the eyeshadow palette first. 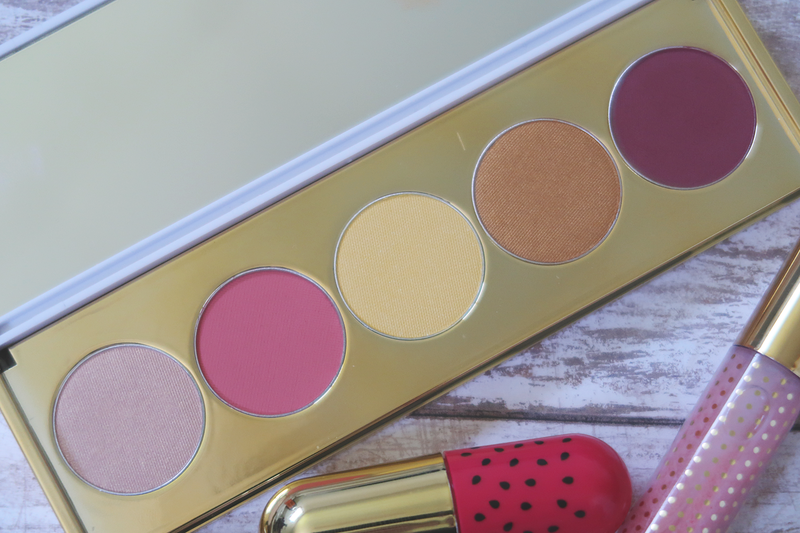 The Marzia La Frutta Palette comes with 5 different shades and they are all limited edition. 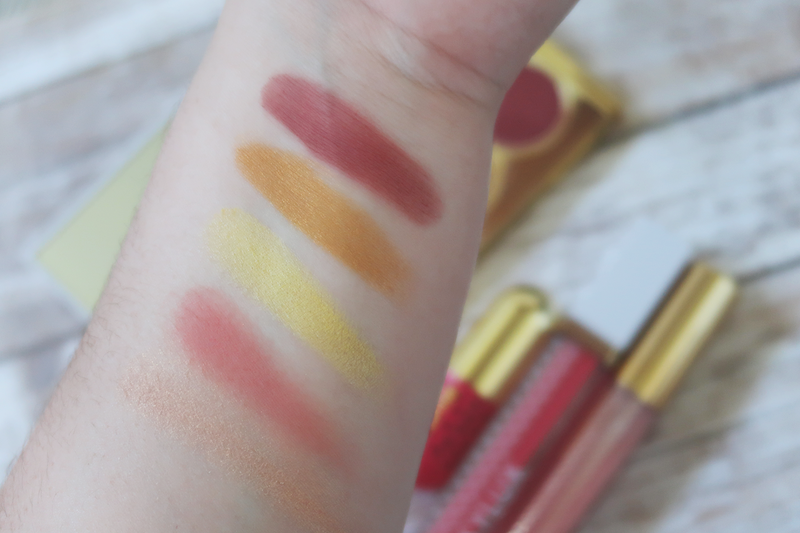 From left to right we have Pesca (shimmery peach), Anguira (matte watermelon shade), Limone (satin lemon), Mango (metallic mango) and Uva (matte grapde). I must say, I am a little disappointed with this palette. 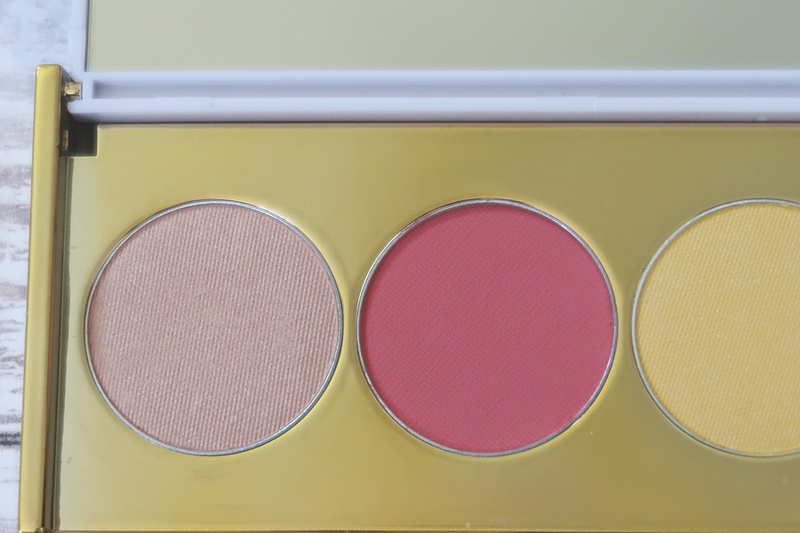 A couple of the shades did perform really well like Limone and Mango but the other shades did not have the greatest pigmentation. I was the most excited for Anguira but the shadow was very dry and I really had to build the color up to get good pigmentation. Uva was a little hard to blend and felt dry as well. 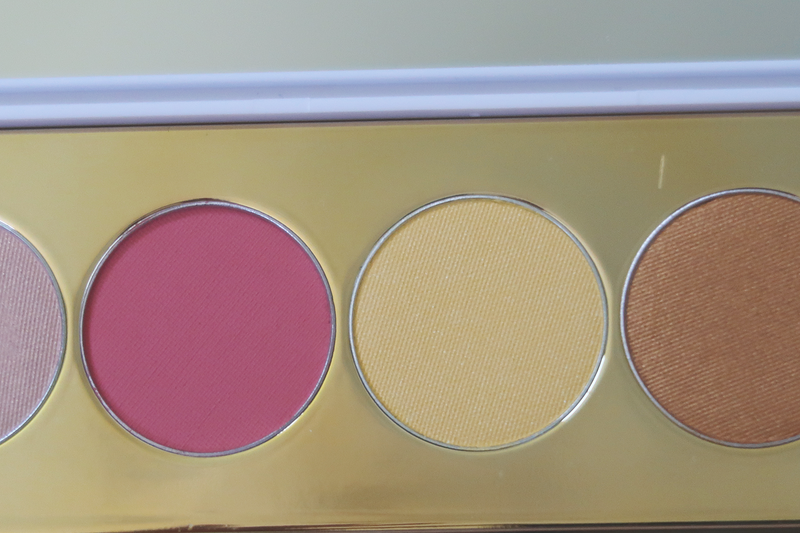 So they are not my favorite mattes but the shade Mango was incredible and worked really well all over the lid. 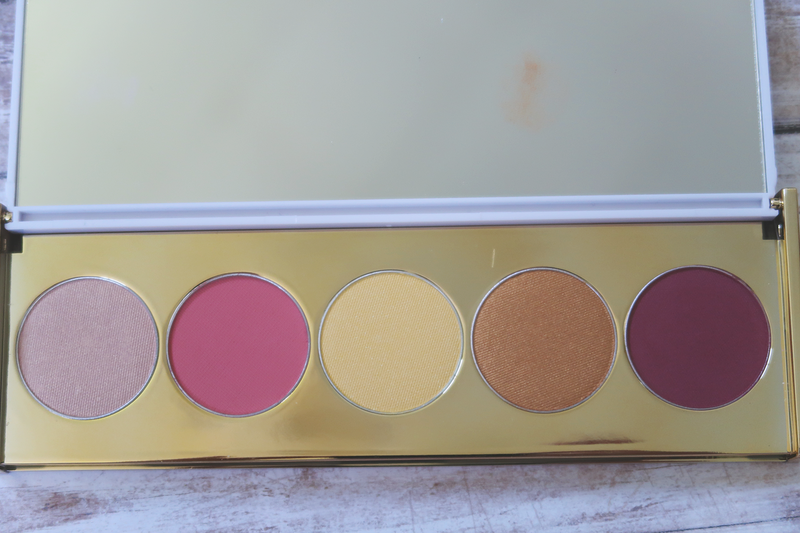 I don't feel like its a palette you have to have in your collection. It is very pretty but I know you would be able to find shades that do perform better. This palette retails for $25.00 and can be found at www.winkylux.com. Next up we have the Pucker Up Lip Plumping Gloss in Pink Lemonade. I actually really enjoy this plumping gloss. It is a really pretty light pink color and just adds a little bit of a natural look to my lips. It does plump my lips a tiny bit and I do like the overall look. This plumping gloss retails for $16.00 and can be found at www.ulta.com. Next is the Watermelon Jelly Balm. I find the Winky Lux jelly balms to be very interesting. This one of course has adorable packaging and when applied to my lips it turns them into a beautiful medium pink shade. With the balms they have a pH-activated ingredients that makes it color changing. I find it very moisturizing on my lips but not sure how often I will reach for it in the future. You can purchase the Watermelon Jelly Balm at www.winkylux.com for $14.00. Lastly is the Glossy Boss in Juicy. This color is seriously so beautiful. It is a pretty coral pink shade and it also smells amazing as well. I love the formula of these glosses! You can purchase the gloss at www.winkylux.com for $15.00. I would love to hear your thoughts on some of these products! 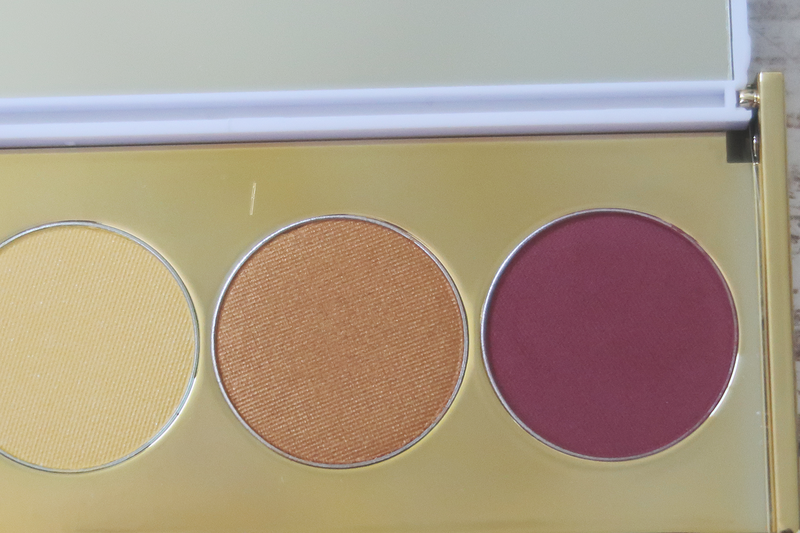 I wish the shadows were a little bit of better quailty on the eyeshadow palette because the shades were stunning. And I highly recommend checking out the plumping gloss as well!